If you like to be inspired, then this was the Open Day not to be missed! Just occasionally a property comes to the market that is really stunning. At Riverwood, in Staverton, there were four such inspiring properties launched on Saturday, 27th May from 10am to 2pm. Staverton is a lively village on the banks of the picturesque River Dart. Famous for Riverford organic food produce, the South Devon Railway and their magnificent steam trains, cider making and for having the best surviving medieval bridge, circa 1413, in Devon. 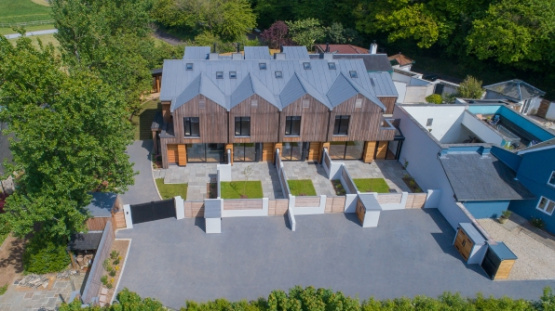 So, having established it’s a good place to live, the Botree Group went about designing and building an exemplary collection of individual houses to complement the charming location. Possibly taking a lead from the seven obtusely pointed arches on the nearby Staverton Bridge, the architect’s rule book was well thumbed at the pages for flair and invention in the design of these four striking homes, now ready for sale. Their approach as developers has been hands on all the way, tweaking the designs and maximising every inch of innovative inspiration out of the internal layouts, with pocket doors and inspiring garden rooms. The quality of the craftmanship is apparent from the moment one steps through the front doors. To their credit, Botree have waited until all the houses are ready for occupation before holding on Open Day. Interest and demand has been high to view this stunning collection of new houses with their bespoke handmade kitchens and bathrooms that combine contemporary with vintage, eclectic and salvaged pieces to great effect. For further information and details of this development, please contact Marchand Petit’s Totnes office on 01803 847979.